The "Yatai" range of portable yard ramps is the result of the Company's commitment to its programme of continuous product improvement and development. Designed by chase to operate under the most arduous of conditions with ease of manoeuvrability and operator use. We manufacture the range to exacting quality control standards by us. All "Yatai" mobile yard ramps are constructed of steel and combine the calculated effective use of materials to give an efficient and balanced transfer of dynamic loads through the structure. The result is a product with a long service life requiring minimal fatigue maintenance. A durable finish to the product is provided by a high specification paint incorporating rust inhibitors. 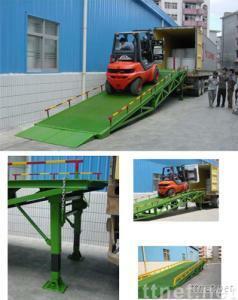 Our ramps are finely balanced to facilitate easy movement. By a forktruck. We include wheel chocks, safety chains and a forklift pushing attachment as standard.